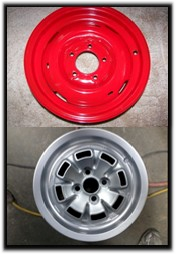 We specialize in powder coating and ceramic coating. We do automotive, motorcycle and aircraft parts. We do industrial items and machinery. We do furniture, both indoor and outdoor. We do exhaust systems and headers to 2000 degrees. In fact, we pretty much will powder coat anything that can withstand the 400 degree curing temperature. We offer over 6,500 colors, and we stock more than 100 different colors and textures. We DO NOT charge any fees for a custom color, even if we do not have it in stock. Immediate delivery – Did you powder coater leave you hanging? We offer overnight service for anything. Need it tomorrow? CALL US! We are open from 8am until 5:30 pm daily, and we work 24 hours if needed to get the job done. You would be suprised at how often we do this. Someone else tell you it can’t be done? Call Springfield Powder Coating. WE CAN do it.